FFee was recently featured on Tcritic.com , a great blog to get all the latest t-shirt reviews and info. 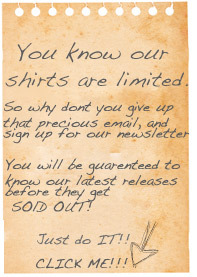 Mr. Wonkey and his brother Phurba would just like to say thanks to Karl for posting about us, and having such a great website to get all the latest info on all style of shirts. They would also like to remind you that they are going to be for Sale VERY soon and we will let you know the minute they are on our site. Keep checking back for new shirts and the latest info. Welcome everyone, after such a successful feedback from the SFWake event, we have decided to start selling our sock monsters along with our shirts. We will be having package deals for the Holidays, and having shirt bundles as well. The sock monsters are not on our site yet but will be there shortly, they will be one of a kind originals. If you see what you want, get it fast before someone else does!!!!! (bottom) Mr. and Mrs. Wonkey decorating the Christmas tree. Hello everyone we just got back from a great time at the SFWake Pros and Joes Event, we had a great time with family and friends. We had an awesome response from the public. We will be updating the site with our newest girls and guys releases, so soon you will be able to check them out in our website. To end with a big thanks to Coastal Surf And Ski, who soon will be carrying our clothing line. Here is a shirt that is soon to be up on the site, just thought that I would give you a preview. Its printed on a super soft cap sleeve t shirt, in a light yellow. Here is a little concept we worked up for a new shirt. It would be printed on a blue shirt, with some darker and lighter blue ink, and the cross on the hat would be done it white ink to mimic embroidery. Let us know what you think!! FFee at the beach (early)! You cant see the details on the hoody in this picture, exept for the pink lining, but I though the photo looked great. Here is a early boynton beach photo showing astrid wearing the black angel hoody. A Small Shirt Idea While You Wait. Here is an idea we are cooking up, if you think its worth printing let us know. We want to be more in touch with our customers and want to hear your feedback. Keep checking our shirt ideas category for new ideas. This one we call Crazy Monkey Thoughts.